Nield, Kerry and Nordstrom, Ardyn T.
In 2011, the National Household Survey replaced the traditional Long Form Census in Canada. The questions in the National Household Survey were similar to the Long Form Census, but responding to this survey was no longer mandatory. This paper provides an empirical analysis of the information loss arising from the change to a voluntary response policy. Comparisons of the differences between the non-mandatory 2011 National Household Survey and the 1996, 2001, and 2006 mandatory Long Form Census are used to identify changes related to the response policy. Using two-sample Kolgomov-Smirnov tests, differences in income distributions are tested to find that high income earners are underrepresented in the voluntary survey. This finding is corroborated by comparisons of various inequality measures across these time periods. Differences in discrete variables are tested using differences in proportions and Pearsons chi-squared tests. Systematic misrepresentation of certain groups is found in the voluntary survey. The switch to a voluntary response policy in 2011 likely led to an over representation of women and married individuals. Nield, Kerry, & Nordstrom, Ardyn T. (2016). 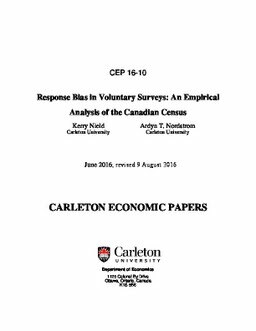 Response Bias in Voluntary Surveys: An Empirical Analysis of the Canadian Census (No. CEP 16-10). Carleton Economic Papers (CEP). Department of Economics.